the physical exam fee for all well visits, sick visits, and rechecks. It does not include the in-patient exams for hospitalized patients or the 45 minute behavior consultations. screening tests recommended for that lifestyle. As an enrollment bonus, cats receive a complementary microchip and lifetime registration. Plans are securely billed monthly to a credit or debit card. 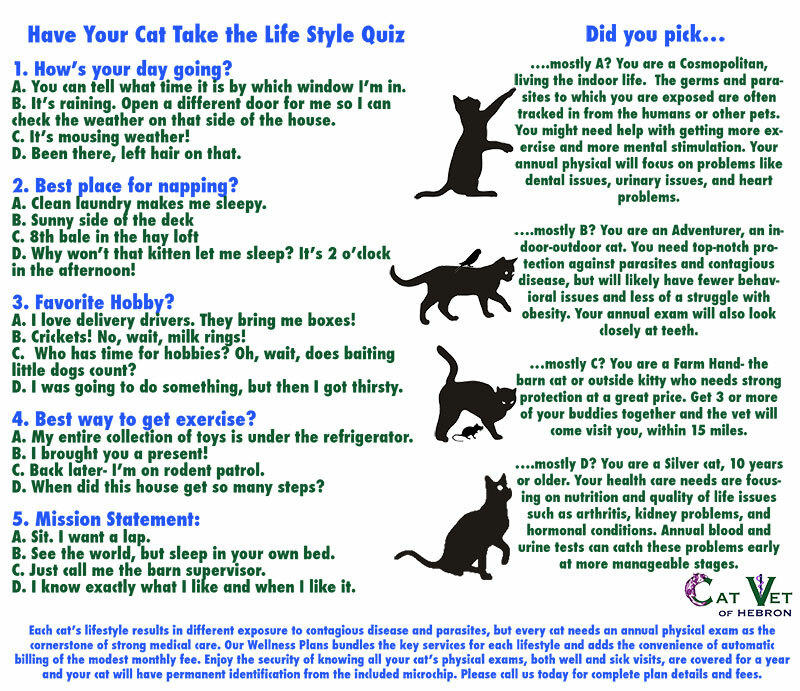 Which plan is right for your cat? Farm Hand: Outdoor and barn cats, vaccinate with FVRCP, Imrab rabies, and feline leukemia. Adventurer: Indoor/outdoor cat: vaccinate with FVRCP, Purevax rabies, and feline leukemia. Screening test for cardiomyopathy every 2 years. Cosmopolitian: Indoor cat, vaccinate with FVRCP and Purevax rabies. Screening test for cardiomyopathy every two years. Dentistry option for any of these 3 plans includes anesthesia, vital sign monitoring, dental x-rays, and scaling and polishing. The usual fees for extractions, periodontal treatments, antibiotics or pain medications apply. Silver: All cats 10 years and older. Includes FVRCP, Purevax rabies and feline leukemia, semiannual blood pressure screening, and 1 set of senior screening labs, including a complete blood count, metabolic profile with thyroid, and a urinalysis. Silver Dentistry option offers the same as above plus IV catheter and IV fluids.